My niece and her husband are expecting their first child anytime now. It’s so fun to see my brother and sister-in-law so excited to see their first grandchild! We already know it’s going to be a baby girl and from the gifts received at the shower, she is going to be the best-dressed baby in Arizona! 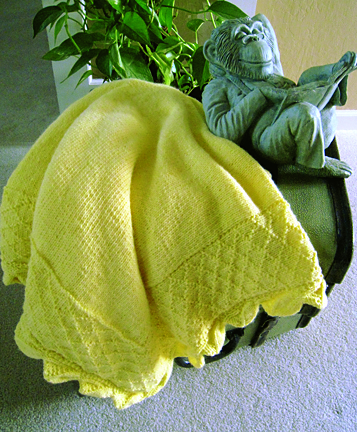 Baby blanket knitted from soft yellow baby yarn. 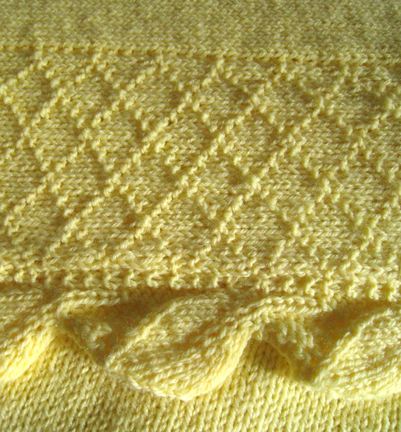 Stockinette with lattice and leaf detail. Since restrictions to flying were going to be put into effect starting at the end of the year, the shower was held the saturday after Christmas. Turned out to be a gorgeous day at the Winchester Country Club up near Auburn, California. Wonderful food, cute table decorations with pairs of baby-girl shoes and flowers, and lots of love. At Thanksgiving I was asked if I could please make a mobile for the baby’s room. Walls are grey and white with black furniture and a sunshine yellow for the accent color in the room. I was shown a photo of a flower ball mobile from Pinterest and figured, yes, I could make something like it. Now to figure out how… After going online and reading some instructions I decided against making it the way they had on Pinterest. A styrofoam ball was used as a base. Then you were to cut a lot of round circles of fabric, fold them into 8ths and then pin them to the ball, using straight pins. Well, right away I was a little freaked out by the use of straight pins in anything for a baby’s room! A definite no on that count. On to plan B… My next plan was to go to the fabric store and take advantage of sales and coupons. While wandering the aisles looking for fabric, that would not fray too much, I was still trying to figure out how to make the balls of fabric. I actually came across a kit to make fabric balls in the quilting area of the store. I quickly looked at the directions and saw that now styrofoam balls and pins were needed. Okay, this was the baby safe way to go! All I had to do was cut circles, oh so many circles, from the three colors of fabric I found; medium grey, black and sunshine yellow. Fold the circles into 8ths and then string the folded triangles onto a strong thread thru the folded point. I would just change the diameter of the circles to make different sized balls. The other thing I had to think of was how to hang this mobile. While I was at the fabric store I found a wooden embroidery hoop for sale. I would use the inner most hoop and wrap it with black ribbon. I also bought wider ribbons to hang the balls. The balls and the hoop went together fairly fast. The only thing I noticed was that when I tied the ends of the thread together to bring all the fabric circles together it left a flat area at the top. To solve this issue I used some wide, wire-edged white satin ribbon to make a bow for each ball. In a way I like it better, as it puts just a touch of femininity to the mobile. I’m waiting for a photo of the mobile hanging in the baby’s nursery. When I get one I’ll add it here. The shower was beautiful and now I could concentrate on the baby blanket I had started right after Christmas. I knew I couldn’t get it finished before the shower, so I decided to send it before the baby was born. Again working with no pattern it took some time to figure out what to do. I had tried the leaf edging quite awhile ago and just loved it. So that had to be part of this blanket. After flipping through my book of knitting stitches I came across the lattice stitch and thought that would be great with the leaf edging. After knitting a swatch for gauge, I started the baby’s blanket. Once I got the right amount of stitches for the size in my head, it went pretty quickly. But the due date is fast approaching and I still had the leaf edging to do. I modified the edging pattern so it wouldn’t be so wide; I wanted the leaves to be closer to the lattice. All it took was casting on eight stitches, working in a pattern and never having more than sixteen stitches. For such a detailed edging it knitted up very fast. Now off to mail it to the parents-to-be! Let me know your thoughts on this post but please play nice!